"Old Mexico's Traditional Salsa" From the heart of Old Mexico, this salsa captures the tradition of using fresh tomatillos (the Mexican tomato), jalapenos and limejuice for a unique and tangy salsa experience. 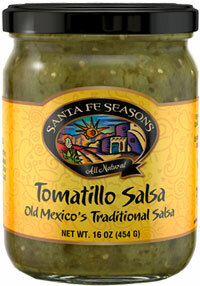 Use on chips, over eggs, or as an accompaniment to any southwestern entrée. Tomatillow, jalapenos, cilantro, canola oil, lime juice, sucanate (dehydrated sugar cane juice), sea salt, garlic powder, spices, xantham gum.